Rama Temmink, former World Record holder untuk 3×3 One Handed average sebelum akhirnya direbut oleh Yumu Tabuchi dari Jepang. Rama sempat 3 kali merebut WR untuk One Handed Average. Dia mempunyai turning saat OH yang smooth, terlihat pelan tetapi efisien. Sahabat dekat Erik Akkersdijk ini mempunyai darah Indonesia. Ibunya, Maria Oey, adalah ibu dari semua cuber Indonesia. Rama sempat datang ke Indonesia saat kompetisi official pertama di Indonesia, Indonesia Open 2009 diadakan. Nama besarnya di dunia cubing sangat disegani. Oh iya, dia punya akun di rubikku.ning.com lho. I saw ‘Macky’s blindfolded World Record being featured on YouTube and I immediately believed it was solveable. (The cube that is). The cube was solved blindfolded in 2 minutes 18.58 seconds and I immediately set a goal for myself which was ‘’if he can do it blindfolded, then I can do it in one minute with two hands’’. And to answer your question, I started playing with the Rubik’s Cube around August, 2006. I haven’t done much lately with cubing, I just go to competitions where Erik keeps bugging me to compete anyway. I stopped practising. I noticed that even without any practice I was almost as fast just before I’ve quit. I use the Cross, First Two Layers, Orientation and Permutation method. You can call it the CFOP method. Most people refer the CFOP as the Fridrich method, but that’s not correct. In the eighties lots of people used CFOP, but Fridrich was the first one to put her algorithm’s on the internet. I just applied for college. I start going to college September 1st 2010, not conservatory, because of my future plans in Indonesia! The Rubik’s Cube is definitely my favourite event, it’s the original one that everyone in the whole world recognizes and besides it doesn’t take too long to solve it nor too short. 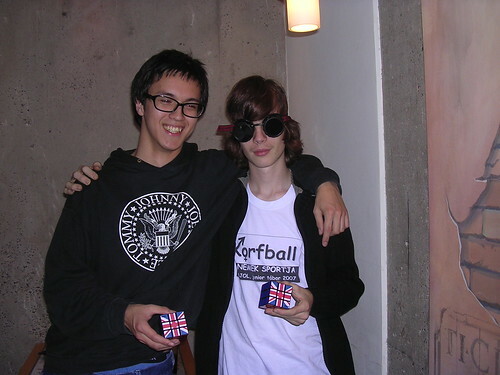 You guys were nice and enthusiastic when I first met you, hang around with you and just before I left you and I am pretty sure you guy’s are just as heartwarming for other foreign cubers. Now about the local speedcubers, most of you just started solving the Rubik’s Cube and before most of you met sub-15 speedcubers so many of you cubers were already fast. I hope I could have inspire the few speedcubers I met in Indonesia to be original in thinking and to have your own style for solving the Rubik’s Cube. You guys already have an Asian Record and a World Record in the pocket. I don’t have to worry about the future for Indonesian cubers. I use solely Rubik’s Cubes. They may be bad at the beginning, but just like a violin it takes lots of practice and breaking in before reaches it’s potential. Being unbeaten for 26 straight rounds for one handed is definitely a nice accomplishment in my ‘modest’ opinion. 10. You are very good in OH, how you practice it? Any secret practice method? I practiced one handed like an idiot, but before I did that I once asked Gilles van den Peereboom on how to get faster with OH and his answer was just to practice a lot. Back my days one handed was all about turning as fast as possible, but it all changed in late 2007 when Takumi Yoshida came up with the R’-flick with your ring-, pinky finger and U-flick with your pointer finger. I suggest you to learn the ‘’Japanese OH fingertricks’’. I learned a lot from a lot of people, but the one who really stood out was and still is Joël van Noort. When I was in Indonesia I loved to explain you guys about the cube, I hope I can help the Indonesian cubing community as much as possible in the future. Yes and then we can go eat Bami GM. Erik Akkersdijk dan Rama Temmink team solving. Keren nih videonya. WOWOWOOWWOWOWOO I like this interview…. thx Rama ! Wah ada Mom. Iya mom, saya juga suka Interview ini. Wkwkw. Hwahaha. Ngaku2 aja lw rif.